In the mood for some freshly sliced sushi? Then look no further than the tasty handmade Japanese cuisine on offer at Wasabi. Their experimental menu is sure to have your tastebuds tingling—and as if the selection they serve wasn’t tempting enough, take a look at the Wasabi offers on our website before you dine and see how much you could save on your order when you redeem a Wasabi voucher at the checkout! Set up in 2003 by Kim, a fresh food market trader in Camden, Wasabi opened their first shop in Embankment, London. His plan was to share a penchant for authentic sushi and bento with Londoners by selling individually wrapped pieces—a novel idea at the time—aiming to provide customers with more room to experiment than the standard pre-packaged box of sushi, and encourage them to sample the various delights of Japanese cuisine. Needless to say the fresh and clean aesthetic at Wasabi won them over in no time, and his menu of sushi, sashimi, California rolls and authentic dishes proved very popular! His customers weren’t only happy to have a tasty change in culinary scenery on their lunch breaks, but they were impressed by how healthy and beautifully presented sushi could be. Over ten years later Wasabi continue to impress their customers with innovative additions to their menus, contemporary flavourful fusions along with fast service and affordable prices. Taste his menu for yourself and make a saving on your order when you search our website for Wasabi vouchers before you dine, just enter in your Wasabi code when you proceed to payment! Stop by our website to pick up a free Wasabi code and then click over to the Wasabi homepage to begin browsing. Select your location, delivery date and time slot then click on “order now”, and browse the sushi selection on offer in your area. Once you’ve located your favourite items, simply add them to your order by choosing the quantity and clicking “Add” and then review this at any point as you shop on the right hand side of the screen. When you are ready to continue to the checkout, you will be able to locate the “Promotional Code” box just beneath your order summary, where you can enter your Wasabi coupon then click “Add Code”. The discount will be automatically applied and your total price updated. After entering your personal information and payment details your order will be confirmed and soon on its way out to you from Wasabi, enjoy a tasty, healthy lunch everyday and all at a great price too! Whether you’re already an expert on Japanese cuisine or you’re trying it out for the first time, when using a free Wasabi voucher to purchase from their expansive selection you will be able to try a whole new world of flavours, with a delicious saving popped in there too! Explore their tempting range for yourself by visiting Wasabi online today, and make sure to treat yourself to all kinds of tasty lunchtime treats when you shop online using free Wasabi offers from our website! Seek inspiration with a flick through their carefully curated menu, then go on to choose your favourite products from Wasabi. Click on the item’s photo to be taken to a more detailed page where you can see further info about the ingredients and flavours of the product. If you’ve decided this is the product for you, then simply click “Add”, or continue browsing for further additions to your order. When you are ready, select “View Basket & Checkout” from the right hand side of the screen to complete your payment and place your order. If you have a Wasabi coupon locate the “Promotion Code” box just beneath your order summary, where you can enter your Wasabi free coupon code then click “Add Code”. The discount will be automatically applied and your total price updated. If you wish to, create a user account with Wasabi to make ordering next time even faster and more convenient. You can also choose to checkout as a guest if you prefer. Complete all your personal details and delivery options as well as your payment information, then simply wait for your food to be delivered! Allow their menu do the rest by clicking over to their website to get started with their online shop. Just remember to collect your free Wasabi voucher from us before you arrive! If you love dining at Wasabi, you might also be interested in eating out at Pizza Express or Las Iguanas. If those restaurants aren't your cup of tea, there plenty of other shops in our Food & Drinks Category that might catch your eye! Please note that the size of your order and your location are considered the determining factors for delivery charges with Wasabi. Therefore you will need to double check before you pay where any fees will be properly outlined in advance of you processing your payment. Wasabi want to make sure that you are perfectly happy with your order, so if there is a problem once you’ve received your food simply get in touch with the restaurant branch from which you ordered and they will be happy to set things right for you; either by sending your food anew, or offering some compensation for your order. Be sure to keep them in your newsfeed, and share the latest updates with friends as soon as the new Wasabi offers becomes available! 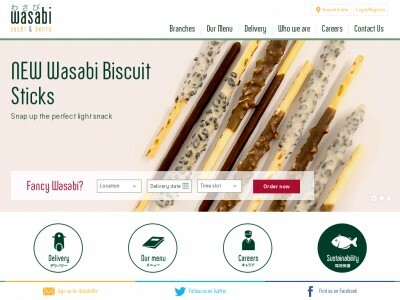 Buy now online at www.wasabi.uk.com. Me and my girlfriends love to go out for Japanese food, but it can get expensive. That's why we were so excited to discover how much we could save on sushi and bento deliveries with a Wasabi voucher. Wasabi offers a wide range of delicious Japanese cuisine delivered to major cities throughout the UK from sushi classics to hot soups and more. With Wasabi vouchers, we can treat ourselves to dinner together more often – all we need to do is visit wasabi.uk.com, enter our Wasabi code and enjoy fantastic deals on all our favourite dishes!